Our stoop was ordinary, just plain wood with four steps and a small platform at the top. Even when it was redone in brick, it could not measure up to the stoops of such Brooklyn brownstones as the one on President Street where my father grew up or the more elegant ones seen in a recent Museum of the City of New York exhibit, Stoops of Manhattan - Railing and Shadows, paintings by Andrew Berrien Jones. I’d never thought about the origin of the word “stoop” until my recent visit to the Museum of the City of New York where I learned that “stoop” is derived from “stoep,” a Dutch word for a small porch, platform, or staircase leading to the entrance of a house or building. Settlers from the Netherlands brought stoops to the Hudson Valley of New York. “Stoop” is a common word in the Northeast and is gaining more popularity elsewhere. The thirty paintings by Andrew Berrien Jones depict the intricate and beautiful details of iron railings and the shadows they cast. The railings on homes in lower Manhattan date from 1830-40. Viewing the paintings I had to wonder why the focus is only now. Artists and photographer have long been attracted to doorways, yet I cannot recall any earlier focus on the visual elements of city stoops. Streetscapes can project their own kind of beauty and I hope there will be more in the future. 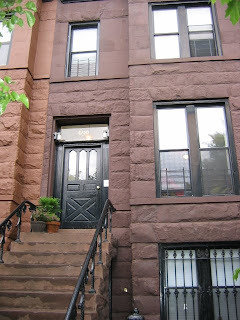 My Flatbush stoop was the place where on warm days and early evenings my sister Nan and I would sit and say hello to our neighbors passing by. Since there was a bus stop in front of our house, the stoop was the spot to wait when our Aunt May was due to arrive. It was always exciting for us to see her step off the bus, carrying an Ebinger’s bakery box.